I promised a post on my foray into guided meditation, and I will deliver on that promise. Just not today. I arrived back home to Toronto very late last night, and now – as usual – have way more things to do than time to so them, so my full post on the guided meditation experience will have to wait until the weekend. What I do offer you today is my idea of how my guided meditation session could have gone. Can you blame me for being so hesitant to give it a whirl? Mine went nothing like this. Well, not much, anyway. I’ll stick with the woman in the ecard too. 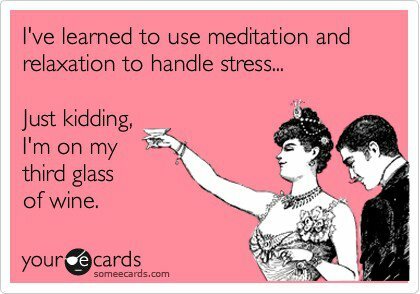 After 2 guided meditation sessions, I gotta say, the e-card is more my style too. Glad you’re safely back home in Toronto, Nancy. Wine is the best kind of zen. Alcohol in all forms is medicinal. I faithfully take my medicine at every opportunity. It will easily take me a “couple” of glasses to write this post. Ha! Finding the videos is easy, it’s finding the time to write a blog post that’s hard. Well that and finding the time to read all my favorite blogs as well. Arrggghhh…why aren’t there more hours in the day?? ?